The pundit pages are pretty boring this week, as they contemplate the big non-news of the GOP midterm victory. This was exactly as predicted, so there’s no tasty pundit juice to be wrung out of it. The Senate seats that were up for grabs were mostly Democratic, many in red states that temporarily swung that way in 2008. For the last half-century, as much as 20% of the electorate stays home during the midterms. 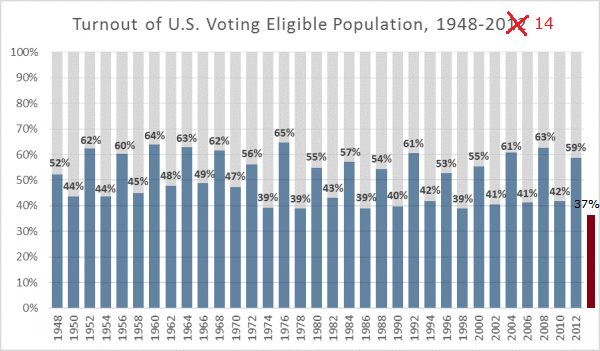 This used to not matter much, but as it happens the people who don’t vote as much (especially the young) skew highly Democratic, and the people who vote all the time (especially the old) skew Republican. You can ignore any pundit who makes a big deal of the Message Of The Election without mentioning this huge factor. I had a frustrating conversation with a friend recently, who expressed discontent with both parties, mostly for doing nothing about the economy. It’s frustrating because it’s a false equivalence. The ongoing recession is GOP policy. At the state level, where they’re mostly in control, they implemented harsh austerity measures: i.e., they fired lots of state workers, making things worse. At the federal level, they tried to do the same thing, and were able to do on on a smaller scale. They have consistently prevented more infrastructure spending or any other stimulus, refused to continue long-term unemployment benefits, opposed Obamacare (a huge boon to entrepreneurs, the unemployed, and the poor). All out of spite because Obama beat them twice. Oh, but they want to reduce the size of government? Piffle. During the recession in 2002, what did they do? Implement an austerity program? Of course, not, they spent money like it was water, because there was a Republican president. Oh, but Obama is to blame somehow? What is he supposed to have done? He can’t pass laws. He can’t make Boehner pass legislation. Even Boehner can’t get his party to pass legislation. When one party is committed to pure obstructionism, our system lets them obstruct to their heart’s content, and a large fraction of the press and public will assume that the other side must be at fault. And the GOP will keep doing it, because to them 2010 and 2014 mean THEY ARE WINNARZ. What happens now? On the macro level, my guess is: not much. The GOP could show that they have a reasonable governing agenda… but any success they’d have would be shared with Obama, so they won’t do that. The safest thing for everyone is to punt to 2016, and I expect there will be a lot of drama but it’ll come down to that. I don’t write much about politics any more, because a) there are pundits who have the patience to do it much better, and b) it’d mostly be like this: frustration that a radical party is tearing the country apart in a fit of fury. About all one can do is take a grim amusement from the absurdity of the drama itself. From that perspective, 2015 should be entertaining– I have a feeling Boehner and McConnell are going to be not-entirely-covertly at war. Plus, filibusters!